Slieve Carn on paper may not seem anything to shout about, but it is its isolation from other hills that is it's strong point. The hill stands proudly above the plains of Mayo and from the summit you can see in a sweeping arc from the Pins past The Reek, taking in Clare Island and then on to Nephin, the Ox Mountains, and even on a clear day the top of Errigal, and thence to Ben Bulbin. It is a pleasant easy walk for the most part if you approach from the West, but in wet weather the last part of the route to the summit across the bog can be treacherous. If you are wanting more strenuous exercise approach from the East [Kiltimagh](1 in 4). 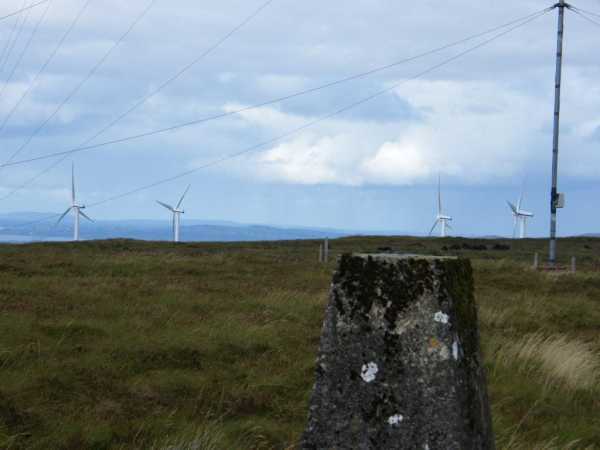 The blanket bog is 'farmed' in most places on the hill, and a recent addition has been 4 wind turbines. Slieve Carn is mentioned in the Statistical Survey Of Mayo (1802) as having coal, and there is also evidence in places of iron deposits. Kestrels, even a buzzard and various other birds have been seen and if you are lucky in summer you may see a flock of Golden Plover. After reading paddyhillsbaggers comments about the access roads condition, we opted to try the minor road crossing Treannagleragh, and then approach via the summit tracks. We took the minor road at M339890 A in Kiltamagh, which brought us to an off set junction at M313898 B, turn left and then right onto the road that climbs to the masts on Treannagleragh. All I can say is don't approach the hill this way, unless you are driving a 4 wheel drive vehicle, with a good clearance below! For those who do, continue on up hill past the masts and turn left at M296902 C, onto a badly rutted — and flooded when we were there — track. Follow this to a track junction at M294890 D, turn left and after a very short distance right at M295890 E onto a slightly better track. There is room to park at M293879 F, by the track junction. From here you can make a direct ascent, across bog, to the summit and its Trig Point, returning by the track that runs along the edge of the forest and then along the road back to your 4x4. Despite the rain, there was good views to be had, before the mist rolled in again.